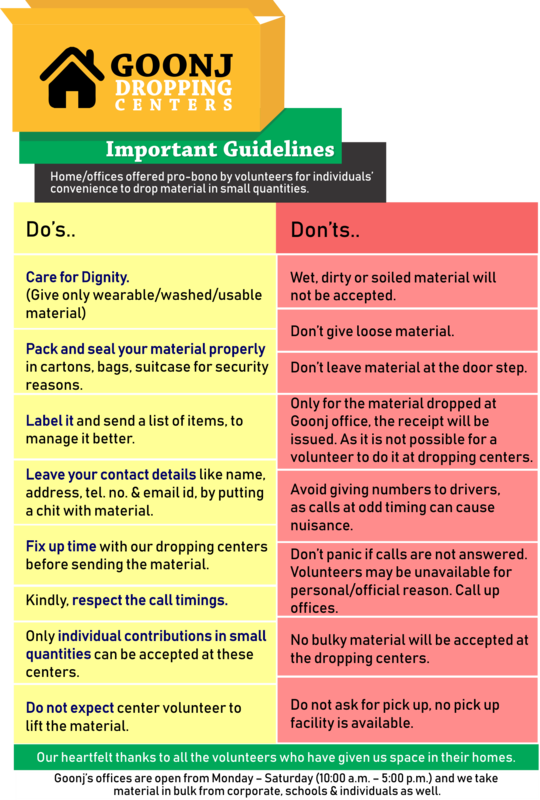 Note: Below is the list of our ‘dropping centres’ run by our volunteers and they are not office of Goonj. KARKARDOOMA: 99, AGCR Enclave, Opp. Karkardooma Court, Karkardooma, New Delhi. DWARKA center has been closed with effect from 15-Nov-18. Please Note: Below are homes of our volunteers, please call and fix up a convenient time. VASUNDHRA : House no. 411, Sector 14, Vasundhra , Opposite to Sabji Mandi Ghaziabad. HISAR: House No. 566, Sector-14, Hisar-125001. MUMBAI- TOWN AREA WORLI: 6, Sea Glimpse, 69 Worli Hill Road, Worli, Mumbai- 400 018. SANTACRUZ (W):Gypsy Rose, 10/11, Arun Bazaar, 2nd Hasnabad Lane, Santacruz (W), Mumbai – 400 054. KALYAN(W): Dental Solutions, Trimbakeshwar Apartment, Near Mahaveer Jain School, Opposite Bank of Baroda, Ganpati CHowk, Agra Road,KalyanWest. Note: this is only a ‘dropping point’ for material and not an office of Goonj. Note: these are only ‘dropping points’ for material and not offices of Goonj. JAIPUR- JAGATPURA: Poppins Pre Primary School, 548, Sri Ram Vihar, Mahal Yojna, Near NRI Colony, Jagatpura, Jaipur – 302025. Note: below is a ‘dropping point’ and not an office of Goonj. Note: Below is list of our ‘Dropping Centres’ run by our volunteers at their homes. You are requested to ALWAYS CALL and FIX a convenient time.